Conference poster remixed from the back cover of More Songs About Buildings and Food. In “The Big Country,” the final track on More Songs About Buildings and Food, David Byrne describes the experience of looking out of an airplane window and feeling abject disgust at the scene below. From such a height, Byrne looks down on the world with an elevated sense of self. On the surface, “The Big Country” is a rejection of rural, flyover America. What begins with childlike awe shifts in the refrain as Byrne sardonically jeers “I wouldn’t live there if you paid me to.” From such a height, Byrne is able to distance himself from the places he sees. In many ways, the song grapples with scale and the isolation it produces. 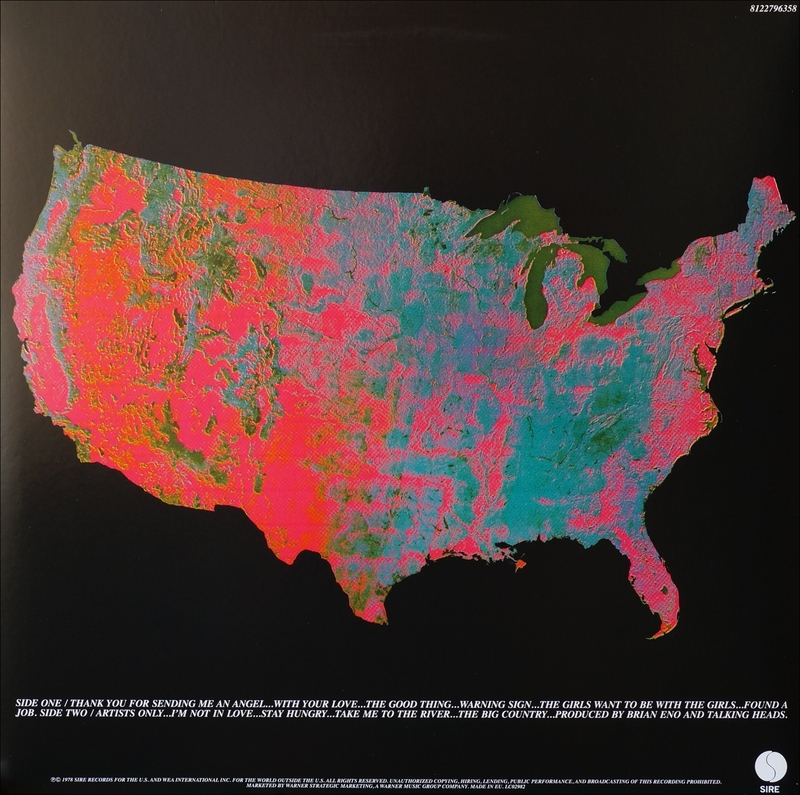 The album as a whole contends with an individual sense of remoteness and remote sensing technologies which augment human perspectives, with its cover remixing the Landsat and Portrait U.S.A projects. Byrne wrote “The Big Country” while flying from Toronto to New York in the midst of a growing public awareness of large-scale environmental disasters happening throughout flyover America. The album was released July 1978, one month before President Carter will declare a State of Emergency at the Love Canal neighborhood in Niagara Falls, NY, an event which played a major part in the creation of the Superfund list. Among the many critiques leveled in More Songs About Buildings and Food, the album undermines Cartesian distinctions of mind/body, body/world, individual/collective, and place/world drawn (in part) by technologies of scale. As technology unsettles Heideggerian notions of “world,” it also opens up new thresholds for considering how individuals relate to place in the age of the Anthropocene. Increasingly, human activity is rewriting earth's biological process on massive scales. From the exosphere to the abyssal depths of the ocean, humans have left their mark everywhere. As our presence is ever-felt, the entanglement of humans and location is increasingly apparent. Place has been defined by writing studies scholars in terms of occupation (Dobrin 2007) and more recently as "the poiesis of a body-place assemblage" (Boyle and Rice 2018). 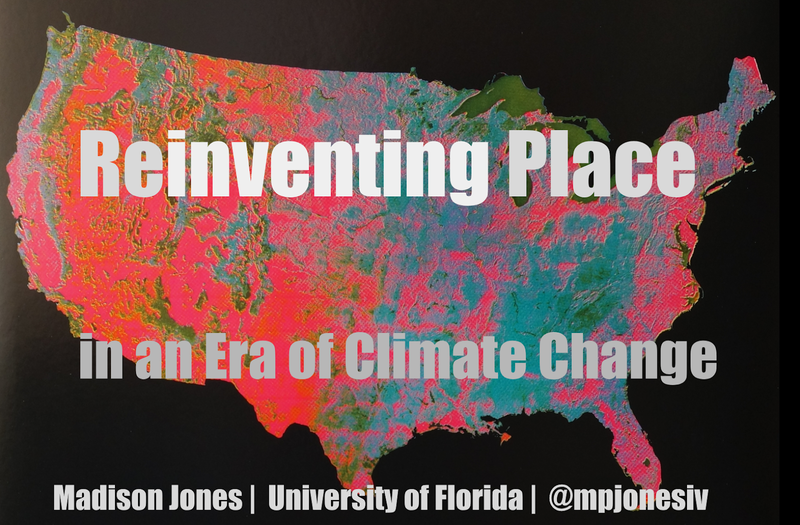 This presentation explores how the relationship between writing and a sense of place shifts as human and natural worlds become deeply enmeshed in an era of climate change. Specific place offers a compelling location to see change. As the separation of human and natural worlds erodes, it is possible to locate a new ecoliteracy in place. 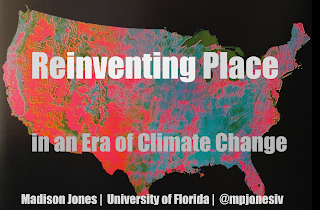 While climate change threatens a sense of place built on scale (Clark, 2015) it also presents compelling opportunities for humans to locate themselves in massive, global environmental issues. 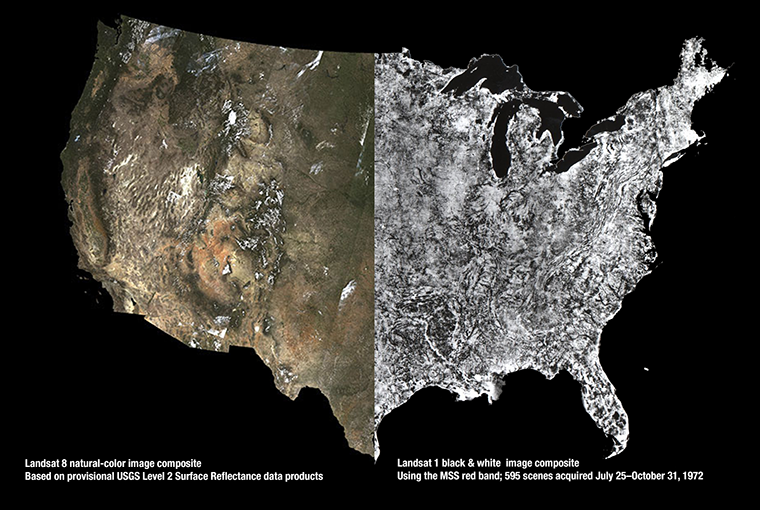 The Landsat project and "Portrait U.S.A"
Comparison of the Landsat 8 mosaic and the Landsat 1 mosaic, courtesy of NASA.gov. 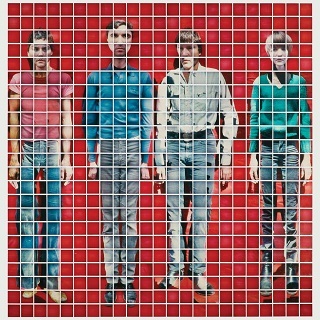 Talking Heads created their own version of Portrait U.S.A. for the album More Songs About Buildings and Food. While many people would (and still do) confuse the image produced from the data collected by satellite, the rear cover was unmistakably a rendering. That is, the image is unmistakably not a photograph. Rear cover of More Songs About Buildings and Food. The record sleeve notes explain that the album image is a “false color image,” and explains the translation from satellite image to album art, comparing the scan lines to that of a T.V. picture. It also describes the practical applications of Landsat photography, ranging from assessing environmental disasters, to observing effects of strip mining and monitoring pollution, to natural resource management. While "Portrait U.S.A." used pseudo-natural colors, the album emphasizes the image as a manipulation by using pastel and metallic colors instead of earth tones. It renders the vast terrains of America as stable, visible, and comprehensible. The album visualizes the environment by drawing our attention to both the ecological thinking produced by photography and mapping technology and the influence of optics in the fabrication of images. Heidegger was disturbed by images of the earth, fearing that imagining the earth from space would produce a sense of placelessness. In Ambient Rhetoric, Thomas Rickert points out that Heidegger saw images of the earth from the moon "as an instance of technology further uprooting humans from their home places" (Heidegger Reader 313, qtd. in Rickert 214). While photographs like "Earthrise" (1968) and "The Blue Marble" (1972) presented a global ecological viewpoint, they also disrupted a sense of place based on locality. "The Blue Marble" By NASA/Apollo 17 crew; taken by either Harrison Schmitt or Ron Evans [Public domain], via Wikimedia Commons. Heidegger seems to wonder, "In the face of such a vast and sublime image, how does one locate oneself?" Today, with the advent of increasingly powerful and widespread mapping and visualization technologies, these concerns seem only amplified. With a few clicks, I can see the best "restaurants and bars for later in the evening," but I can't make the kinds of connections that Byrne does from his holistic, aeronautical viewpoint. Our ability to locate ourselves with such apparent ease displaces us in relation to large-scale problems like climate change (what Timothy Morton calls "hyperobjects"). Similarly, "The Big Country" ends with Byrne, in a near reworking of Heidegger, saying "I'm tired of traveling. I want to be somewhere." While there is more to this issue than I can properly address in a blog post (or a conference presentation, you'll be glad to hear), I'll conclude by discussing one interesting methodology created by Gregory Ulmer to address the problem of locating a sense of self or place in the face of the massive shifts produced by technology. In Electronic Monuments, Ulmer describes the MEmorial as a type of digital project which begins with a collective problem or disaster and works to create a means of visualizing, representing, and monitoring that disaster. MEmorials are not intended to condemn or pass judgment but instead to make visible otherwise invisible sacrifices made on behalf of certain cultural or national values (p. xiii). Recent examples of MEmorial projects are Sean Morey's "Deepwater Horizon Roadkill Tollbooth" which negotiates the connections between Morey's individual reliance on fossil fuels and the larger disaster of fossil fuel-dependence as well as the project Jacob Greene and I created to document the deaths of cyclists in the dangerous roadways of Jacksonville, Florida. Rather than see large-scale problems as "accidents," MEmorials make visible the underlying collective and individual values which produce these issues. While traditional monuments often mask or abject the values which contribute to abject losses, MEmorials work to bring these values to the surface. They also establish how individuals relate to collective problems. Morey points out that MEmorials function as "a virtual monument" constructed "through the networking of images from the BP oil spill, the infrastructure and practices of traveling on Florida's roads that depend on oil, and my personal association with these spaces and practices." Similarly, More Songs About Buildings and Food might be thought of as a kind of MEmorial mapping project. By moving from a higher-scale perspective (from the airplane window) to imagining a ground truth connection to place, Byrne is able to negotiate collective problems as an individual. Album front cover via Wikimedia Commons. Like the composite Landsat photographs used to make "Portrait U.S.A.," the front cover uses 529 close-up Polaroids of the band to produce a distorted mosaic image of the band. To me, this technique suggests similar connections to technological apparatus, visualization, and imag(in)ing place through the relational values that form individuals and collectives. That's all for this post, but in an upcoming post, I'll discuss how I implemented this album in a classroom MEmorial mapping assignment. This past winter I spent a month in Greece, traveling and researching, something I’ve wanted to do for years. I have long been interested in the relationship between the material environment and ancient rhetorics, especially concerning Plato’s dialogues, but I never had the means to go and see the places I was reading and writing about. I was very fortunate to receive a research travel award from my institution, which made this incredible opportunity possible for me. My trip led to more discoveries than I can ramble off in one post, but I’m planning a series of future posts reflecting on parts of the trip and how it contributed to my thinking about rhetoric and writing.